There are no tents or canopies allowed in the cabin area. Lake Stephens is now offering cabin rentals. Currently, there are 7 cabins available. Each has a picnic table, grill, air conditioning, fire ring, and parking for two vehicles. Cabins are open for rentals year round. The Campground Store and office is located at the entrance across from the tent camping and cabin areas. 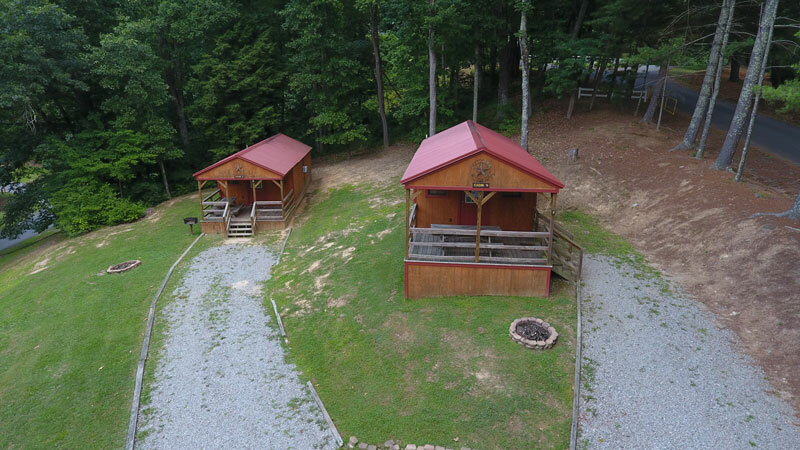 The Campground Store has showers and restroom facilities for cabin guests, however, all cabins are equipped with restroom/shower facilities, and offer firewood, ice, and other camping basics. No pets, smoking, or alcohol allowed. Basic necessities to bring when renting a cabin include: comforters/blankets, pillows, towels, pots & pans, dishes, utensils, charcoal for the outdoor grill (small & large cabins only). There is a coffee pot included, but guests must bring their own filters & coffee. WE HAVE UPDATED THE OLDER CABINS. NEW PICTURES COMING SOON!!! Alcoholic beverages are strictly prohibited within the lake stephens park boundaries! One responsible person who has passed his/her 21st birthday shall be at each campsite. Quiet hours are from 10:00 pm to 7:00 am. However, please always be considerate of everyone around you at all times. All campers must register at the office. Visitors not registered as overnight guests must vacate the park by 10:00pm. There are no canopies or tents allowed in the RV park. The gathering of fire wood is not permitted. Campers may bring their own or purchase it from the camp store. No modifications are to be made to any campsite. Digging, trenching, planting or other means is strictly prohibited. No object may be driven into any tree, shrub, rock, sign, building or other object or structure in any rcra campground. No use of hay or straw. The use of illegal fireworks is strictly prohibited. RCRA is not responsible for any loss or damages to equipment due to fire or any other cause. Also, the RCRA is not responsible for any equipment left unattended. All pets must be kept on a leash. You must clean up after your pets. All boats, jet skis, etc. and/or trailers must be parked in the designated areas. Any of these vehicles at any campsite is not permitted. Maximum speed limit in the park is 5 mph unless otherwise posted. No pets allowed on the beach!